In order to upload a lesson to your blog you need to configure an account that provides the information ScreenSteps needs in order to communicate with your blog. This lesson will provide a general overview of how to create and configure an account. For more detailed information on configuring Web Export accounts please see the Publishing to Blogs & Wikis manual. After clicking the + button a new account will be created. Use the Type menu to select your blog type. Now you need to tell ScreenSteps which url (1) to use in order to communicate with your blog or wiki. The example url (2) indicates a typical location for the selected Type. For example, ScreenSteps uses the XML-RPC protocol to communicate with WordPress so you need to enter the url to the xmlrpc.php file in your WordPress installation. Fill in your information for the Server (1), User Name (2), and Password (3). To verify that you have correctly entered your information click the Test Connection button (4). 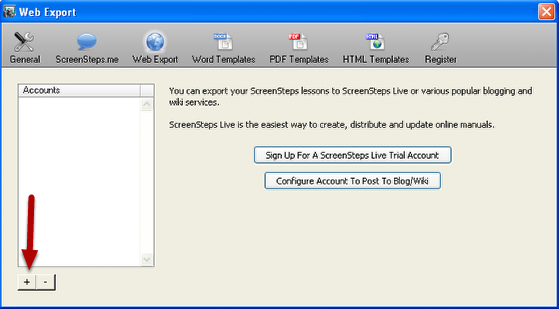 If ScreenSteps is able to communicate with your blog using the supplied information then a green check mark will appear next to the Text Connection button. Otherwise an error message will be displayed. If successful then you can now upload your lessons to your blog using the Blog/Web export feature. 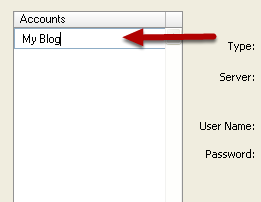 Now that you have configured your blog account you can rename the account by double-clicking on the name in the Accounts list and entering a more meaningful name. Any support for Mac OS X Wiki/Blog server? I looked at adding support for this last year but I was unable to find any support for adding content from outside sources (an API). If Apple provides an API then we can most likely add support for it. It would be nice to have Sharepoint or FTP as an option, or even e-mail. Not currently. When we first worked on blog integration blogger didn't support the uploading images. You had to host the images elsewhere. I believe blogger has been updated since then so we will look at implementing it for a future version. Our university uses a MediaWiki server. Does Screensteps support a wiki upload to this configuration? We do not currently MediaWiki. Last time I looked into it the MediaWiki API had no support for uploading images to pages. I just did a quick search on Google and the API page and didn't see any image upload references. Once the API has support for images we can revisit MediaWiki support. 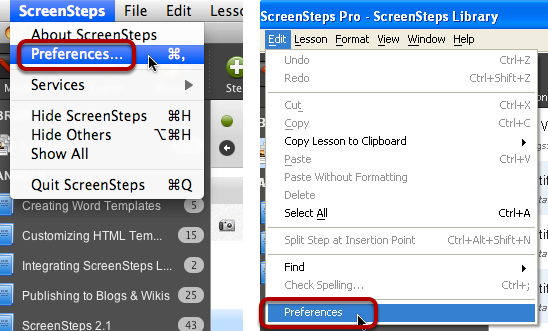 ScreenSteps is testing out a new feature that I just tried using for exporting to Blogger. It worked great - images are hosted on Picasa. First, love your product. Finding new uses for it all the time. Question is, has anything changed with Lion Server Wiki integration? 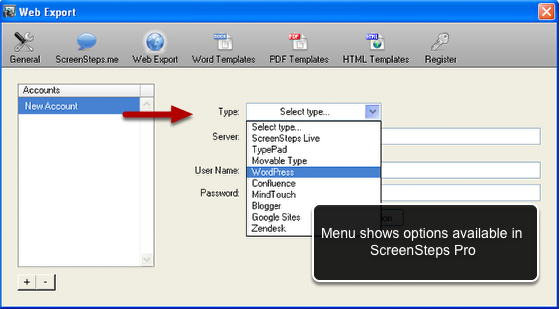 @Ernesto - ScreenSteps does not support Lion Server wiki integration. We have not looked to see if the wiki has an appropriate API or not. Is it possible to export/publish to a private wordpress.com site? If not, is there a private, free publishing alternative aside from Google Sites? @Charise - yes it is. Just use the URL to your wordpress site and then add xmlrpc.php to the end of it.